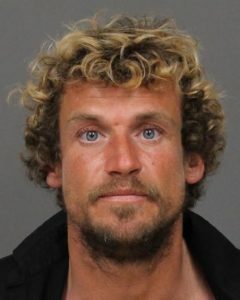 A man evaded capture only temporarily after threatening an employee at a San Luis Obispo store on Tuesday with a knife, according to police. Upon arresting the man, officers learned the suspect had also been using a knife to damage cars. Around 9:40 p.m., a citizen reported that a man was threatening an employee with knife. The suspect fled before officers arrived at the scene. Witnesses describe the man as a white transient who was wearing a brown trench coat and carrying an athletic bag. At 3:47 p.m. on Wednesday, the victim saw the suspect in front of the store and called 911. Officers then found Dawayne Tuleya several blocks away and the victim identified him as the suspect. Officers arrested Tuleya on charges of felony criminal threats and brandishing. Additionally, police determined Tuleya had vandalized three cars with a knife over the last month. The damage to the vehicles is estimated to be more than $5,000. Police also charged Tuleya with felony vandalism. Tuleya is currently in San Luis Obispo County Jail with his bail set at $90,000. If Democratic Senator Scott Wiener from San Francisco continues to have his cake and eat it, too, crimes like Dawayne Tuleya allegedly committed will be reduced to mere misdemeanors. In fact, it’s interesting that vandalism is still considered a felony in California. What’s up with that? Why does anyone go downtown anymore? It was stupid to keep the County Court and Government offices downtown when they could have been moved down Highway 1 where the Jail and Animal Shelter are. Give it a few more years. People will get tired of the crime downtown, and the government workers will be itching to move out of downtown. We have idiots fighting with cops and they get $20,000 in bail and this guy gets $90,000?!?! Looks to me like he couldn’t post $900 in bail. A Google search shows he was arrested March 29, here in SLO for public intoxication. I don’t know what the problem is in this town, but the transients are out of control here. Don’t even think about walking around any dark corners in the city at night. If the stupid locals would quit falling for their hard luck stories and giving them money every day, maybe they’d leave. If all of you bleeding hearts think you will ever solve the homeless problem(I call them bums) you are either stupid or naive. There is an empty state hospital in Camirillo round the up and put them there.If you think you are helping them by giving them money you are just feeding their alcohol and drug habit. Are the police no longer able to tell the press the residency of an arrested person? Or are transients able get away with not carrying any identification? We are not yet a completely fascist/communist state. No citizen is required to carry identification papers in public unless doing something requiring a license such as driving a motor vehicle. As for transients, by definition they don’t have a permanent address or residence. Yep. Another one of our homeless fine citizens who give so much to society and take so little. Heck, don’t build anything and they still come. They must have believed the marketing about the happiest town in America. The weather is nice and the Cops are harmless. Same reason bums show up in Santa Cruz and Santa Barbara.